Cryptojacking! This terminology may seem new to you. But, since the time cryptocurrency was created, there are those who have been hijacking our computers to use its power to generate cryptocurrencies for themselves. This has resulted in excessive CPU usage which leads to slower processors or worse, viruses which eat into the RAM of the PC. We have seen it happen in the past. But, it used to pop up on computers that regularly visited shady sites on the darknet or in Bit Torrent. 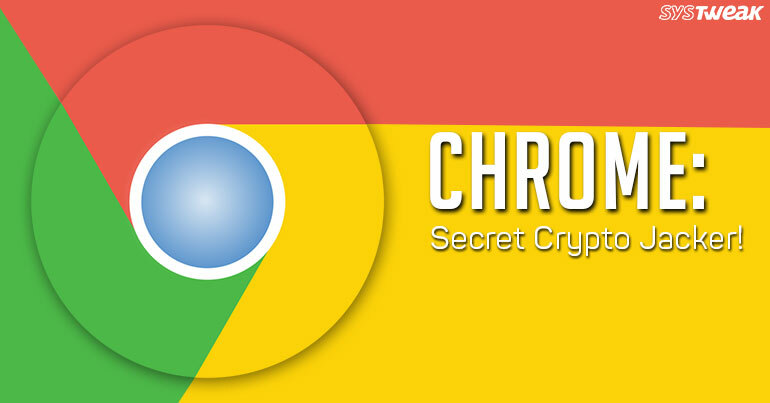 What was surprising was that it has been recently detected in the most reliable and extensively used web browser, Google Chrome. How the Tables Have Turned? ‘Archive Poster’, (since deleted) was a Chrome browser extension. Google has become synonymous with customer friendliness, which is why this has come as quite a nasty surprise for its users. The extension used our PC’s power to solve algorithms and mine cryptocurrency. It did this when Tumblr users, accessed it. The crypto mining tool, that had implanted itself on to the web browser extension was ‘CoinHive’. It prided itself as being inconspicuous and ad free. What begets mention is that tumblr is a creative social site and its demographic users are aged from 13 to 20. It is highly doubtful, they would have realised what the extension was doing as it ran. While this ‘bug’, was first detected in December ‘17, it was only recently that it was finally deleted. Many of us are aware that to mine a Bitcoin or any other cryptocurrency, one needs an exhaustive amount of CPU power. This extension was not only roping in the user’s PC, but also of all the multiple users that were using it simultaneously. Talk about a synchronized hack attack! As Bitcoin continues to gain popularity, such instances are bound to be on the rise. Monero, a cryptocurrency is particularly notorious for phishing customers via web browser mining. Coinhive had a script running on its window to mine Monero. Even, The Pirate Bay, a famous torrenting site, followed this path and mined cryptos off the user’s PC to increase their own funding. This has resulted on an onslaught of hidden crypto jacking just like Chrome was mentioned above. See Also: Ripple: Meet The Hottest New Cryptocurrency! Bid Adieu to Crypto Jackers! While, there are those who would prefer to mine cryptos instead of facing pop-up ads, the problem with such mining is that you eventually lose control over the PC. One has no idea of how many cryptos have been mined and how you can get it to stop! This also opens doors to multiple virus attacks which can lead to your PC Data to be corrupted or hacked into. We suggest that, you do not let any random site have access to your PC without your consent and if you do want to mine, do so for yourself and not an unknown entity. Next Read: Why are Cryptocurrencies Falling?